The long-tailed minivet (Pericrocotus ethologus) belongs to the family of cuckooshrikes and minivets, the Campephagidae. 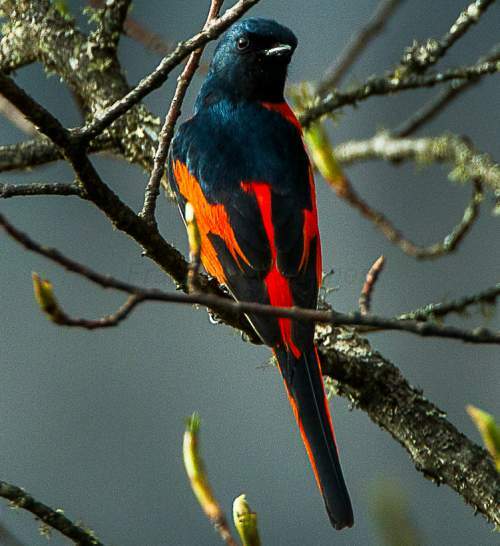 The long-tailed minivet species is distributed in Afghanistan, Pakistan, India, Nepal, Bhutan, Bangladesh, Myanmar, Thailand, Laos, Vietnam and China. These species have proportionately longer tail among the minivets. These minivets are polytypic species. The long-tailed minivet (Pericrocotus ethologus) is a medium-sized minivet, measuring 17 to 20 cm in length and weighing 18 to 20 grams. These birds are sexually dimorphic. The males of these minivet species have glossy bluish-black head, chin, throat and upperparts. The rump and the underparts are crimson. The black wings have broad red patches. The black tail has red outer tail feathers. 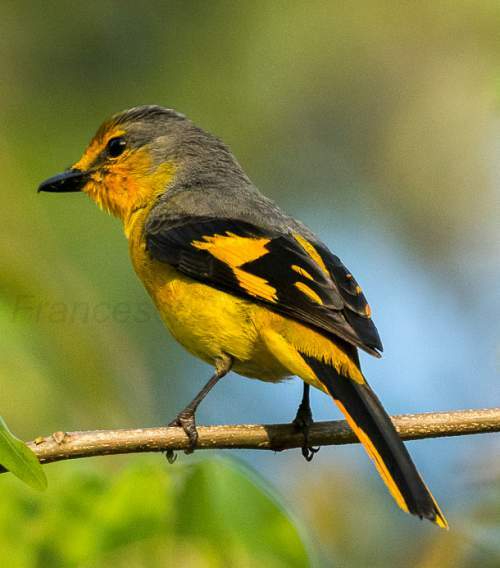 The female long-tailed minivet has yellow forehead, grayish crown, nape, ear coverts and back. There is a grayish lore and a yellowish supercilium. The rump is yellowish. The black wings have large yellow patches. The tail is black with yellow outer feathers. The bill is, short, strong and black. The tip of the upper mandible is hooked. The irises are black. The legs and feet are dark gray. The call of these minivet species is a sweet, rolling repeated "prrr’wi" or "pi-ru" sound. Migratory breeding populations of the long-tailed minivets are distributed in northern Pakistan, northern India along the Himalayas, Nepal, Bhutan, southern Tibet (China), central and southern China. Resident breeding populations of the long-tailed minivets are distributed in south of northeast India, parts of Myanmar, northern Thailand, northern Laos and northern and central Vietnam. Wintering long-tailed minivets are distributed in Afghanistan, Pakistan, central India, Bangladesh and parts of Myanmar, Thailand, Laos and Vietnam. 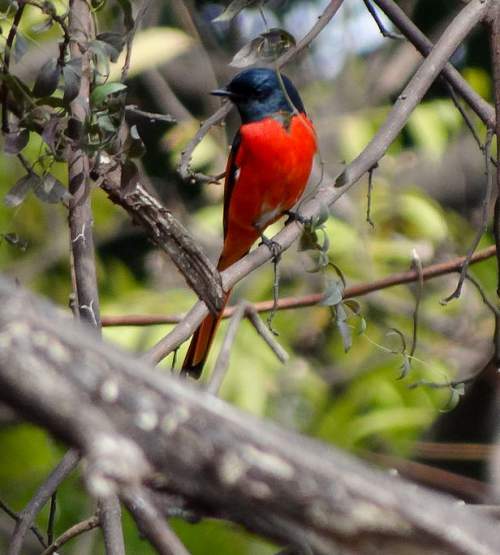 These long-tailed minivet species have moderate forest dependence. They normally occur in altitudes from 0 to 2000 meters. The artificial ecosystems and habitats of these species include agricultural lands, rural gardens and plantations. The natural ecosystems and habitats of these long-tailed minivet species include tropical and subtropical dry forests, tropical and subtropical moist lowland forests, broadleaf and pine forests, foothill forests and moist montane forests. The diet of this long-tailed minivet consists mainly of insects. Insects, insect larvae, spiders, ants, bees, grasshoppers, crickets, cicadas, locust, dragonflies and beetles are their primary food. These species glean insects from foliage as well as hawk flying insects from the canopy. The breeding season of these long-tailed minivets is from April to June in most of their range. These species are monogamous. The breeding pair build the nest. The nesting sites include branches of trees and shrubs. The nest is a cup shaped structure built with rootlets, twigs and grass. It is bound with cobweb and lichen. These long-tailed minivet species are partially migratory birds. The populations in northern ranges are migratory and move southwards for wintering. The global population size of the long-tailed minivet (Pericrocotus ethologus) has not been quantified. The overall population trend of the species is considered to be stable. In most of its range, this species is reported to be common and locally scarce. The generation length is not known. Its distribution size is about 10,100,000 sq.km. Habitat alteration and destruction and deforestation are the main threats that are endangering the survival of these minivet species. The long-tailed minivet (Pericrocotus ethologus) does not approach the thresholds for being Vulnerable, either under the range size criterion, or under the population trend criterion or under the population size criterion. The CITES (Convention on International Trade in Endangered Species of Wild Fauna and Flora) status is ‘Not Evaluated’ for the long-tailed minivet (Pericrocotus ethologus). The long-tailed minivet (Pericrocotus ethologus) is closely related to Sunda minivet (Pericrocotus miniatus). Current topic in Birds of India: Long-tailed minivet - Pericrocotus ethologus.